Growing up, Thursday nights meant Cheers, Seinfeld and Friends. NBC ruled the ratings, but after those shows went off the air, the truth is Thursday nights really have been blah. 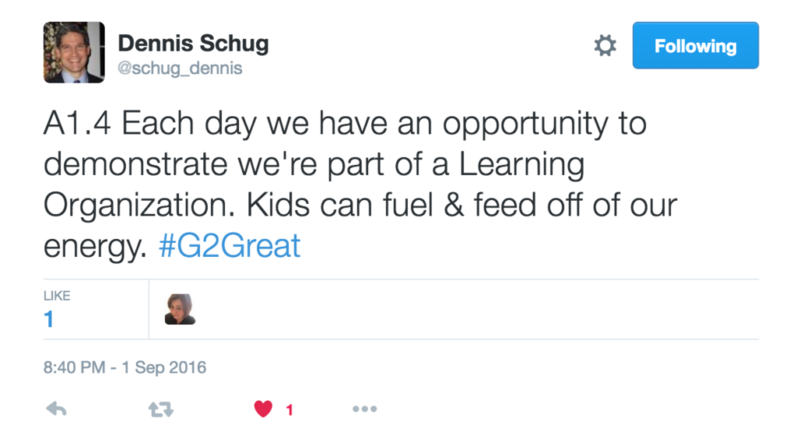 That was until….#G2Great. While only in its second season, the ratings are through the roof. 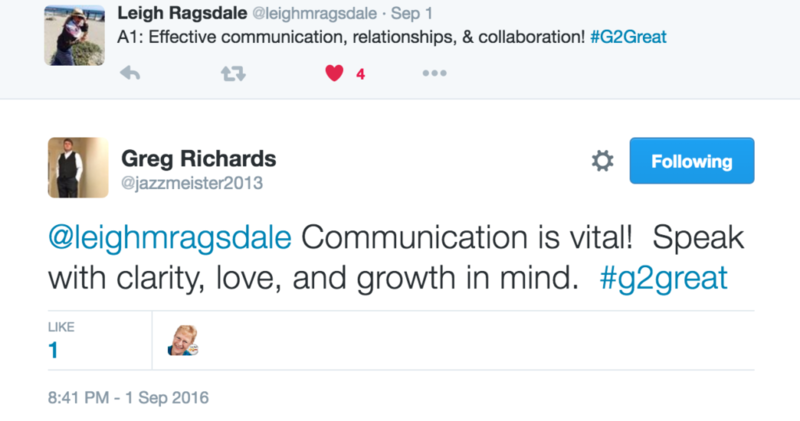 Not many Twitter chats trend almost every week and word has spread across the Twittersphere that #G2Great is the place to be. 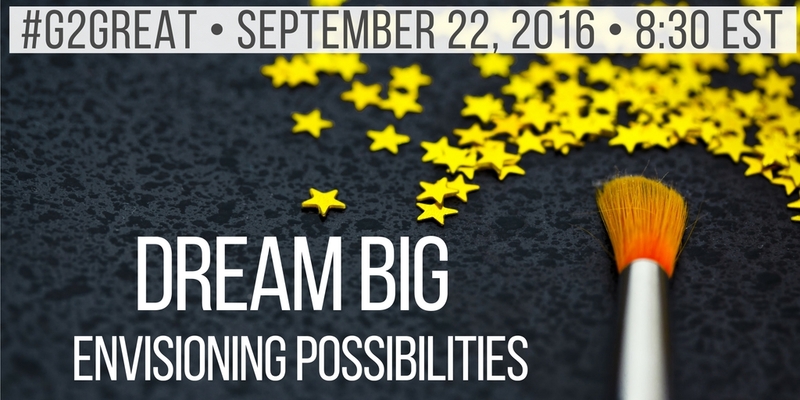 This past week’s episode, Dream BIG: Envisioning Possibilities, did more to inspire than Sam, Jerry and Rachel combined. We might be biased, but this episode was right up our alley because the scenes are near and dear to the work that both of us feel so passionately about. One moment as we go to a commercial break…. 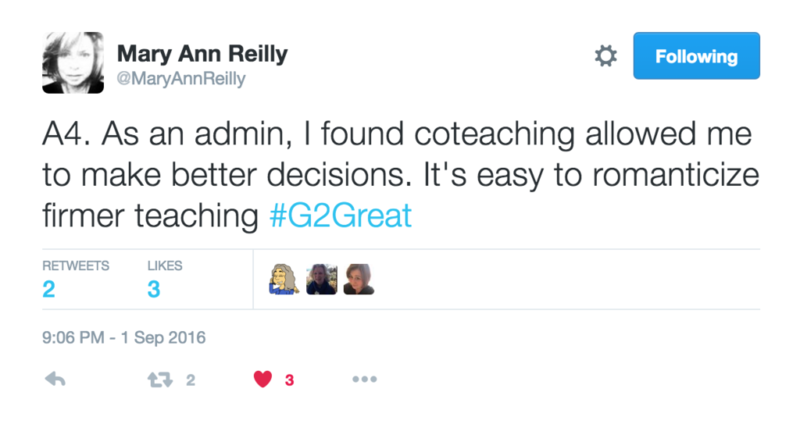 We co-produce a small, independent blog 2 Teachers Let Me Shine. At the heart of this production, is our curiosity in identifying the critical factors that need to be in place in order to let students shine. 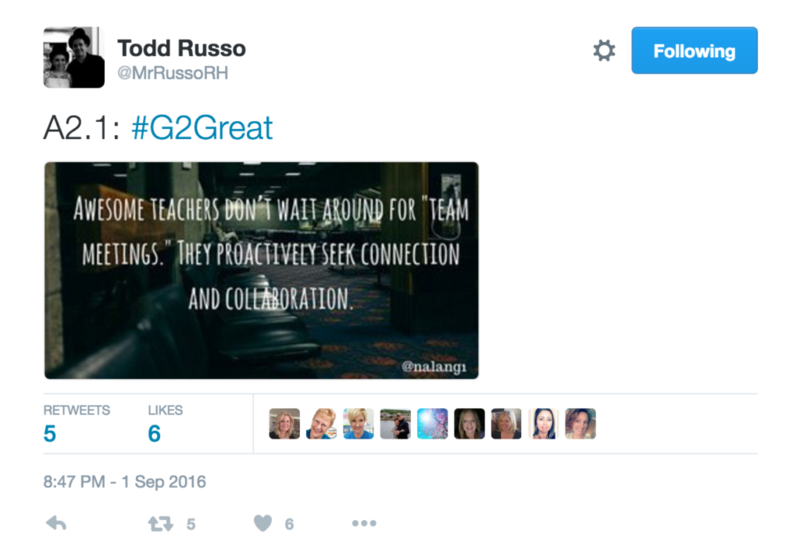 #G2Great is no longer a pilot! It is here to stay. You too, can be in future episodes. It is a place where the cast of characters always Dreams Big and lets each other Shine. #2tlmshine Join us! 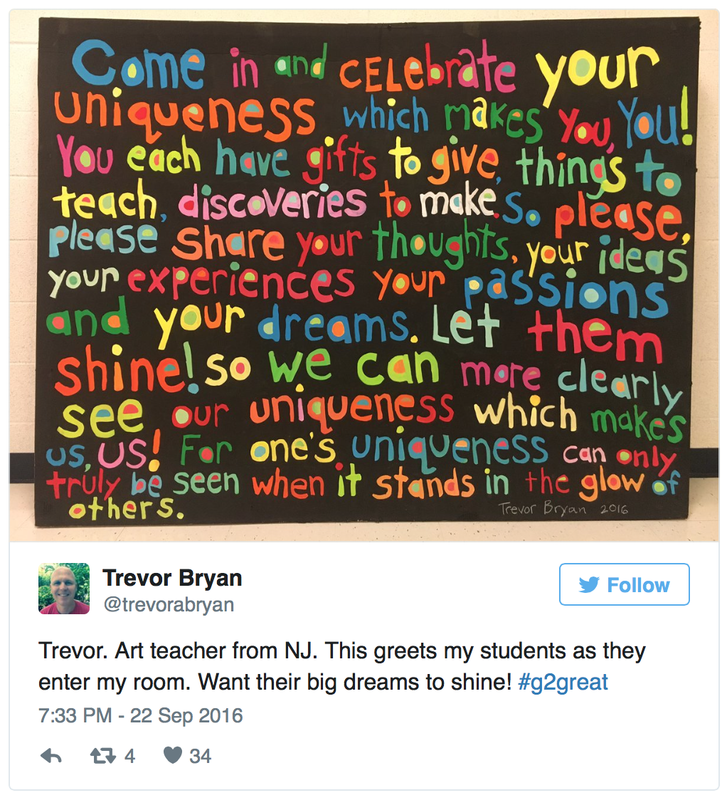 Our friend and fellow #G2Great cast member Trevor Bryan encapsulates it so perfectly…. 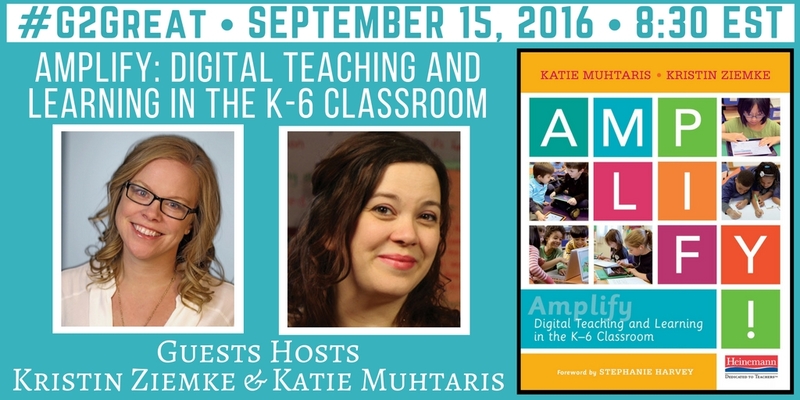 On September 15, 2016 #G2Great welcomed Kristin Ziemke and Katie Muhtaris as guest hosts to celebrate their book, Amplify: Digital Teaching and Learning in the K-6 Classroom. In their book, Kristin and Katie bring their readers on a journey to explore technology as a creative tool for the classroom. Throughout the chat I found myself reflecting on my own journey as I have learned about and explored different technologies. That journey at times was uncomfortable, that uncomfortable feeling that we learn to embrace when we accept the perspective of a learner. That feeling that has the power to make someone run for the hills or charge the mountain. 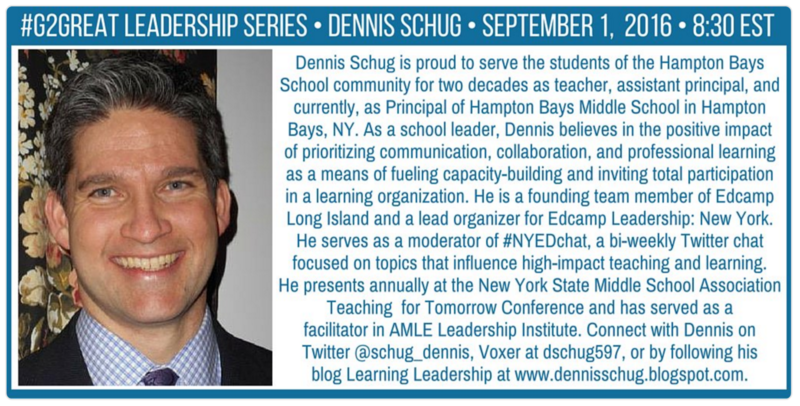 As a learner, I might want to run for the hills at times, but because of my curiosity, my choice and my commitment to learning, I choose instead to charge the mountain. 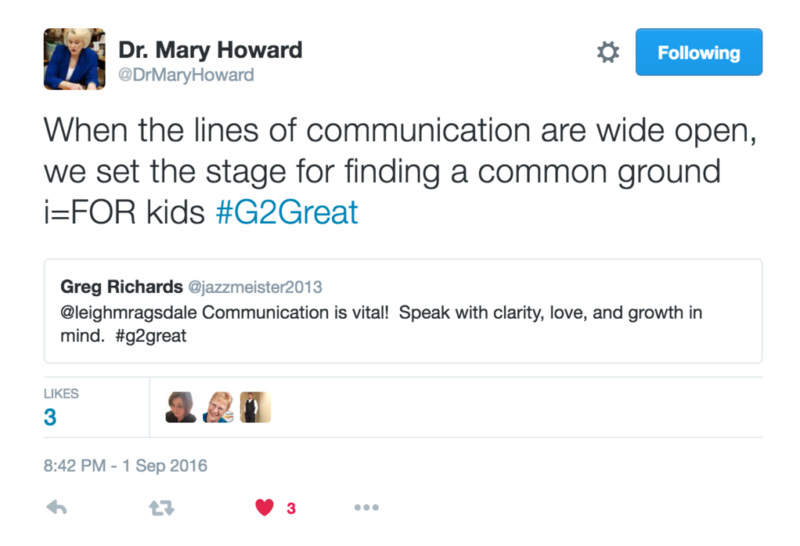 Of course, it helps that I have my #G2Great tribe on that mountain reaching out their hands to me as I begin the upward climb. It helps all of us on our journey to know that we have Kristin and Katie to walk alongside us and to help us empower our students by maximizing the effective use of technology. Technology brings this uncomfortable feeling simply because as it improves, technology is in a perpetual state of changing, and change is really about learning and growing. Take a moment to read the tweets below and be inspired by Kristin and Katie and their passion for the journey. Bring along your curiosity and wonder and you will begin to envision the possibilities on this amazing learning journey. Instructional choices around incorporating technology must be grounded in meaningful work and providing authentic opportunities for students to learn, create and share. In this sense, the context and purpose of our technology choices requires thoughtful consideration and must be grounded in ways that will elevate thinking. Technology or the latest, hottest new app cannot be used just for the sake of using it. We have to remember to be thoughtful and intentional in our instructional decision making around technology implementation. Asking questions such as “Is this meaningful?” “What is the purpose of using this technology?” “Will using this technology elevate students’ thinking and learning?” Once we feel confident in these answers we can consider student choice. Integrating technology adds a layer of responsibility on us to facilitate students making choices around the effective use of technology. Kristin reminds us that even in the digital age we have to keep Allington’s research around choice, volume and response close by in our instructional planning and decision making. The final tweet from Kristin really exemplifies why all educators should read Kristin and Katie’s book, Amplify: Digital Teaching and Learning in the K-6 Classroom. 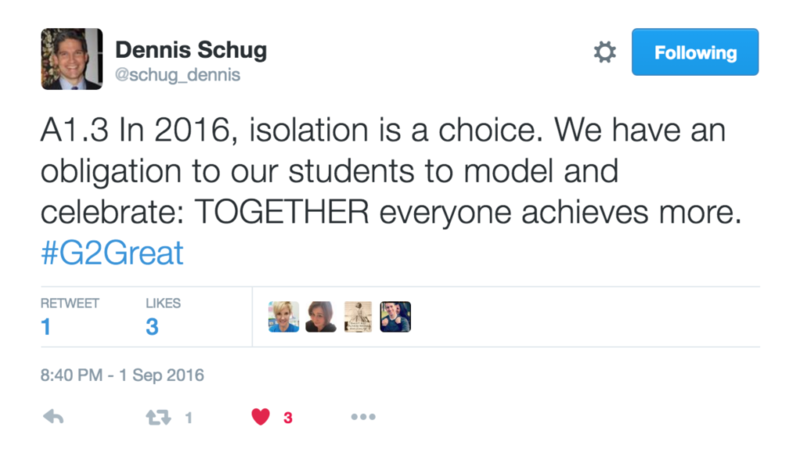 Kristin closed the chat with this tweet, “At the end of the day, tech is about AMPLIFYing students’ stories. When we know a child’s story we can teach them appropriately.” The possibilities are endless when we incorporate technology into the learning environment. So much is possible when we know our students and where they are in their learning as well as in their lives. When we allow students to show us what they know, and listen to their stories we are in a better position to engage and motivate students to learn, create and share. Whether you are just beginning your journey or you are still on your journey in learning and using technology in your school, I encourage you to join me and charge the mountain and join us on the #G2Great mountaintop. As you look up to the top of the mountain you’ll see hands there to support you to the top of the mountain with Kristen and Katie’s book there to guide our continuing journey. We are grateful to Kristin and Katie for deepening our thinking and empowering us on the journey as we empower students and improve thinking and learning. If you would like to learn more about Katie and Kristin’s work follow them on Twitter and check out the links below. 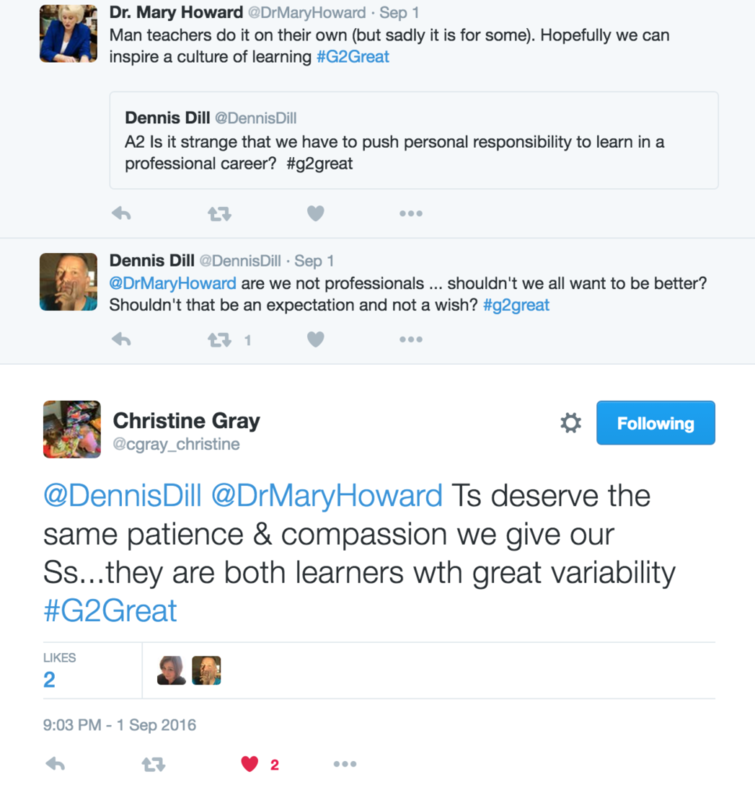 On September 8, 2016 #G2Great hosted a chat, Inspiring Our Work Through a Sense of Professional Curiosity. This year I embarked on a new path in my professional journey. After the end of my first week of a new position in a new school, this was just the right dose of reflection I needed. The topic of curiosity is so important to me as I begin this journey. The dictionary says, curiosity is a strong desire to know or learn something while the thesaurus calls it ‘a spirit of inquiry’. I was in the classroom for so long and loved every moment with my students but I knew something was nagging at me – that something more was out there for me to explore. 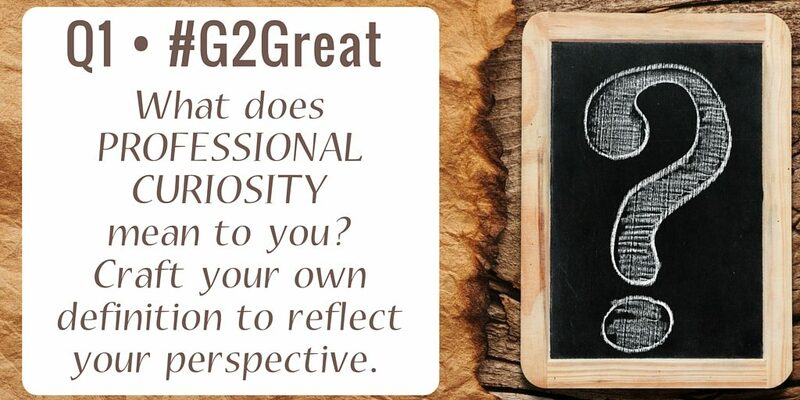 So as I joined in on the #G2Great chat Thursday night I reflected about what curiosity meant to me. On my 10 year anniversary my husband and I went snowmobiling through Montana, Wyoming and Idaho. Temperatures plummeted to 40 and 50 degrees below zero but we still spent up to 10 hours seeing everything we could before the sun set. We didn’t let dangerously cold temperatures stop us. We were inspired by the beauty and the unknown. We were curious. Just as I am inspired in my personal life, I am equally inspired in my professional life. Leaving my 5th grade classroom was hard, like being exposed to the plummeting temperatures. My desire to know more and be more is like the inspiring views of the boundless beauty on my snowmobile ride. My curiosity protects me from the fear of change. That “spirit of inquiry” ignites a “spirit of curiosity” for my professional journey. As I continue to think about what curiosity means to me, I looked back on our first question. 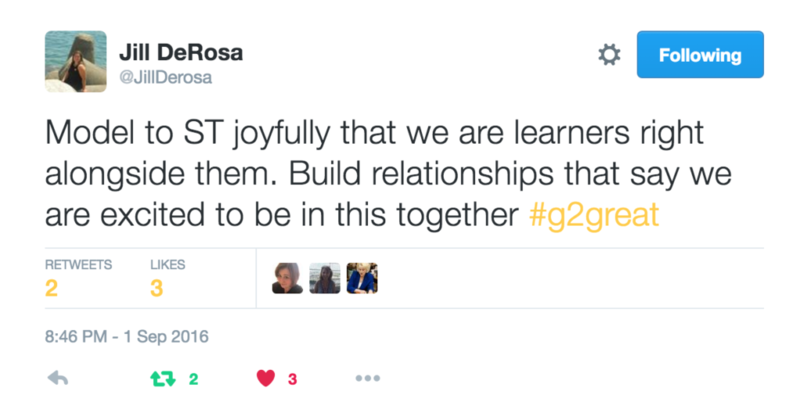 I was inspired by #G2Great tweets that led me to five key ideas that will support my thinking this year. As Lauren points out, curiosity ignites something wondrous in us. We feel alive, happy, and motivated as we explore and discover. It must be my curiosity that drives me to want to be the best because it is not competition that fuels my fire. I am not trying to be better than anyone. I don’t even know where I am going to wind up but my role as a reading teacher affords me an opportunity to move in that direction as I explore the possibilities ahead. My decision to leave the classroom has been years in the making. My passion for all things literacy landed me as a reading teacher, a coach. So when I saw the question, What does professional curiosity mean to you? I knew this was important. My curiosity was fueled by my passion that brought me down this path, but now I want to be sure I stay curious as I sift through the initiatives, mandates, and difficult days. Chris Quinn’s tweet reminds me that professional curiosity is what links me to a growth mindset and my commitment to keep learning. This year I will commit to embracing a growth mindset as I navigate my new role to collaborate with teachers and grow side-by-side with them. The first day of school usually meant welcoming wide-eyed 5th graders into OUR room. I had my routines, my classroom management and best practices down to a science. This year as the doors in my new school opened, I was fortunate to stand by and watch through my admiring lens as teachers welcomed THEIR new students. My curiosity piqued as I learned how amazing and unique teachers are. I learned so much in my first week about how change can be the flame that keeps my curiosity burning. Spanish, Arabic, and Polish are some of the languages spoken by the students in my new school. I have absolutely no experience with this. How can I possibly be in my profession for this long and not know how to help students? This is a very vulnerable position to be in as a teacher. I am a person who likes to have control over my teaching. I took the hand of a lovely 4th grader who speaks only Arabic. I speak only English. We walked down the small corridors and stopped at things I thought would be important for her to know. Girls bathroom, the office, the BOYS bathroom, and the fire extinguisher. Together we practiced saying the words that matched the places we visited. On this day, my curiosity inspired me to take a baby step for this one child within this one moment. During the chat I realized that I was feeding my professional curiosity right on the spot. Fran reminded me that professional curiosity is about wanting to know more for the sake of our entire community of learners while Kari reminded me how this drives us towards figuring out what we can do to have the biggest impact. Suddenly, it hit me! My curiosity isn’t just a gift for self-fulfillment It’s a gift to be shared with others so that we can collaborate in a shared commitment to our students. I know that my impact this year will always lead back to children. What will you do this year to enrich your professional curiosity? 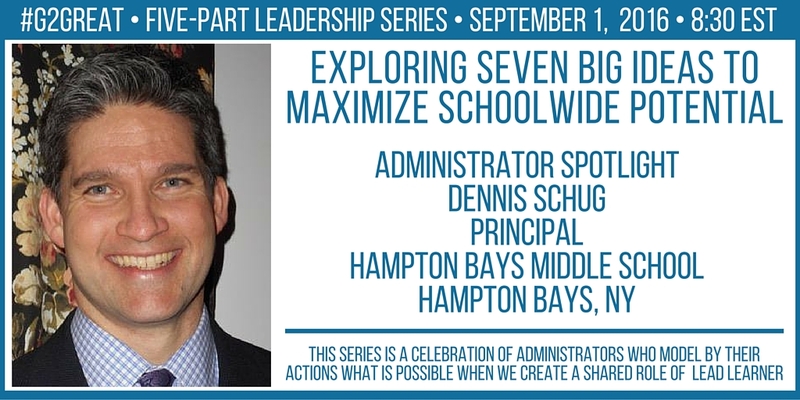 How do we get to that “sweet spot” Dennis describes so that we can encourage learning and growth for all members of a school community? 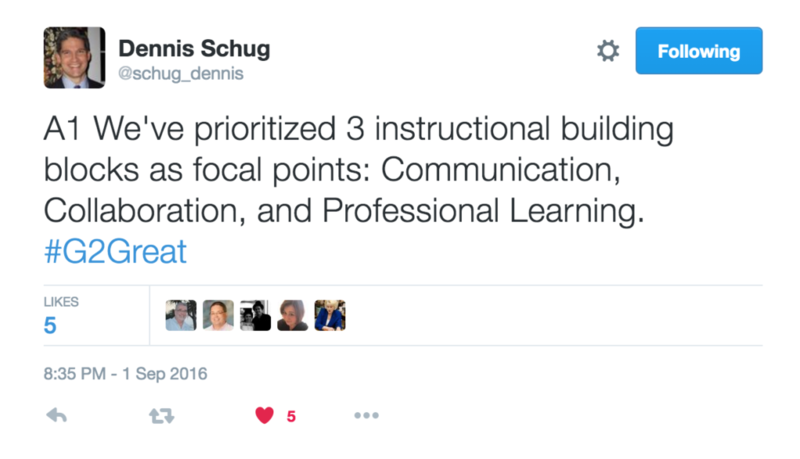 Promoting a positive school environment begins with three building blocks: Communication, Collaboration, and Professional Learning. 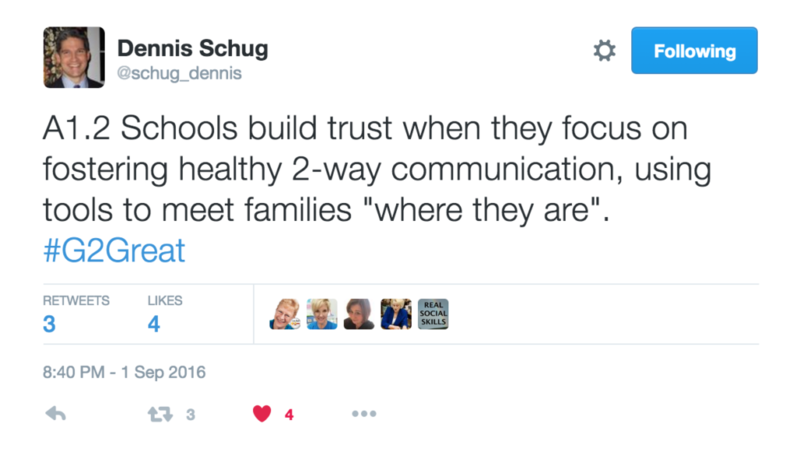 How can we work together for what is in the best interest of our students? We begin by saying “Yes.” Yes to what is possible if we open ourselves up to communication. Yes to more if we open ourselves up to collaboration. 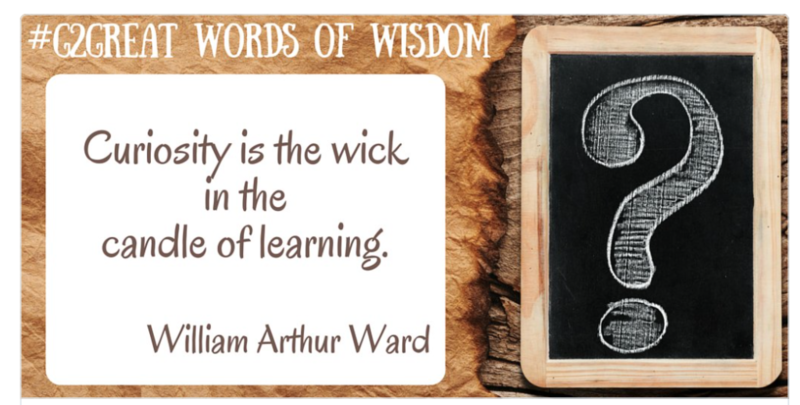 Yes to vitality if we open ourselves up to professional learning. Dennis you made us think of our collective potential and have inspired us all to dream. You have stirred our excitement for a new school year. Thank you for hosting #G2Great and for your service in the name of students everywhere.